Daily swimming activities are structured to be safe, fun, and instructional. Pool time is supervised by certified life guards and staff. Counselors interact with campers to create spontaneous games in the pool. On the first time in the pool, everyone does a swim test to ascertain their skill level. If a camper’s swimming level is not where it should be for the deep end, they will wear a lifejacket and swim only in the shallow end. 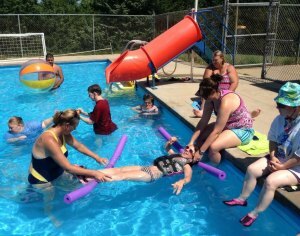 Campers who need it, receive on-on-one support in the pool. Campers who choose not to swim have a shaded area where they can watch, talk with other campers and counselors, or play games. There are lots of fun, inclusive yard games like tether ball, ladder golf, and playing with our big yard ball to engage campers and staff. There is always something to do at camp…even if it’s just sitting and enjoying a relaxing afternoon! What a thrill to learn how to hit a bull’s-eye. Campers are taught the skills of target-shooting with bow and arrow. 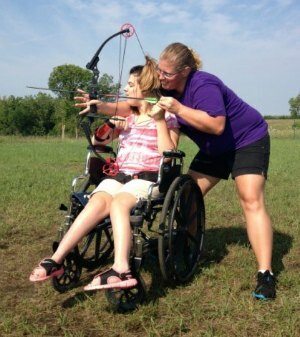 Through practice, persistence, safety and fun, archery builds confidence and self-control. All who want to participate can. We assist each camper to have a good experience with this sport. Gathering around a campfire is one of the most memorable things we do at camp. We sing camp songs, do silly skits, roast marshmallows for s’mores, and even have a cookout. Crafts are an integral part of camp life, beginning with tie-dying your own t-shirt! Everyone looks forward to the delight of seeing what the dyes look like after they are done. Everyone gets to do camp crafts with patient, caring staff. Some of the campers enjoy chalk drawing on the patio. Often the crafts are developed into a theme for the week with lots of take home items to cherish. With 165 acres of lakefront property, this is a beautiful place to explore. There are lots of established trails through woods, over wooden bridges, and through prairie grass. Campers who are able can explore by foot. 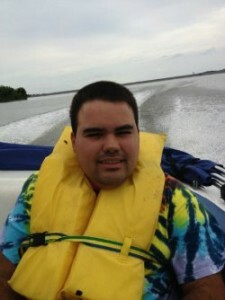 For the comfort of others, there is a hay rack ride or golf cart to see some of the beautiful lakeside scenery. Camp’s boat takes campers (in lifejackets, of course) out on the lake to see more of our surroundings and feel the wind on their faces. Surrounded on three sides by water, Camp White is established on a large, beautiful peninsula in the center of Council Grove Lake. Every evening, depending on the weather, we gather to watch the beautiful lake scenery at Vesper Point. It’s a time for favorite church songs, a bible message, sharing and connecting to God, nature and each other. It becomes one of the most meaningful aspects of camp for all. When the weather keeps us inside, we do a Vesper service in the dining hall. It’s still a special time in comfort! Camp songs are like no other! We sing grace before every meal, we sing after meals, and we do fun “repeat-after-me” songs at campfires and church songs at Vespers. Lots of smiles, laughter and bonding are created with songs. Campers look forward to their talent show all week! Campers sing karaoke style, do a dance, or make a costume for their super hero performance. 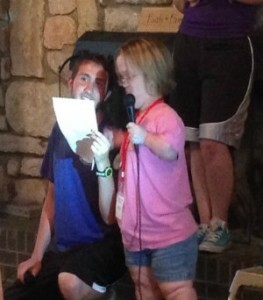 Sometimes they perform by themselves and other times with a group of campers or counselors. It’s a very fun time for performers and audience alike! Wow, what fun the camp dance is! There are line dances, wheel chair dances, and dances for everyone. Fun music, party atmosphere and lots of laughs!